Since making his debut back in 2009, producer, DJ and Red Bull Music Academy alumni Rupert Taylor, aka xxxy, has chalked up an impressively eclectic run of singles and 12"s for labels including Rinse, Formant and Ten Thousand Yen. 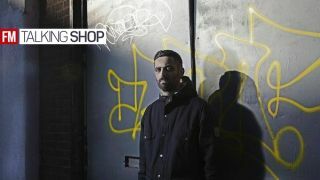 His releases, remixes and DJ sets across those five or so years have seen him skirt around the edges of classic House, Techno and Garage to create his own confident, and distinctly British, take on dance music - and develop into one of the UK's most reliable and dexterous DJs in the process. With his latest 12" for Ten Thousand Yen, Goldfish/Evade, out this week, Taylor invited Future Music into his studio to talk gear and share some production advice. "I started out in bands; playing guitar and singing. It wasn't until much later when I started going out to clubs more that I started messing around in Reason making terrible Drum 'n' Bass. My main inspirations at the time would have been Calibre and Photek but I couldn't really work out how to deal with samples in Reason and also trying to emulate two production geniuses when you've only just started is pretty frustrating." "I'm currently working in a home setup after giving up my studio about three months ago to get some extra money together to move to Berlin later this year. "With it being in the bedroom I don't have as much space as I would like, but I've been able to squeeze in my Juno 60 and JX-3P in the corner and make space for the Moog Minitaur, the Eventide Space and the Volca Beats and Bass on the desk. There are some drum machines (707 & JoMox XBase 09) and some guitar pedals (ProCo Rat and Electro-Harmonix Memory Boy) that are boxed up right now. "I use a mixture of hardware and software; the Moog gets used a lot for bass, the Space is set up as my default reverb send. "The Juno 60 is connected to a Kenton pro DCB so I can send MIDI, arp clock and VCF cutoff to it. Sometimes it gets used for bass and I send it quite hot into the soundcard (Focusrite Saffire Pro 40) to add a little bit of distortion, other times I use it for pads and arps, so I back off the level a bit. "The JX-3P has a nice thin sound, which sits quite nicely in the mix, it mainly gets used for string sounds and for layers on top of VSTi tracks. "The two Novation controllers (SL mkII and Launch Control XL) I use to mix tracks and set send levels without having to use the mouse and keyboard. The Maschine is used to write drums and also to play samples. "I quite like the current setup; everything is close to hand so I can automate the hardware and the software quite intuitively. The downsides are that, if it's hot outside then the room becomes unbearable to sit in and my iMac starts freaking out and I mainly have to work on headphones as well as the Yamaha HS50s, which are not the most fun to mix on. (I have a pair of Adam A7xs which are currently setup with my decks)." "I use Ableton and have done for about five years. I started out in Reason and then moved onto Cubase SX3 because it was easier to work with samples but I found myself being frustrated by the limitations of software not really made for electronic music production. A friend showed me Ableton and the ability to do pretty much anything you wanted, be it automate a parameter or setup a sidechain, in just a couple of clicks really appealed to me. "I think the best DAW allows you to do anything you want with you having to work out how to do it and that's why I enjoy producing in Ableton. It feels transparent and unobtrusive in my setup and workflow." "It's a toss up between the Juno 60 and the Eventide Space but I think the Eventide wins out because I use it on every track. The reverb algorithms are superb and you can create some really cool effects with it." "I have been really enjoying the ValhallaDSP Vintage Verb, I was looking for another reverb as an alternative for the Space and this is superb, been demoing their Ubermod multi tap delay plugin and I think I will be buying that as well. "I also got the Dub Machines Max For Live devices; one of them is based on the Roland Space Echo and is brilliant." "A Jupiter 8 would be my dream synth, it's just so lush sounding." "I normally start with the drums, or a drum loop that I have sampled, and then I normally add in synths or a sample that I want to use, which forms the main hook of the track then the bassline will be added. "The hardware is already hooked up (thanks to my friend Matti) and ready to be used when I need it to be and I take bits from everywhere and add it to the mix." "I am working on a bunch of darker, clubbier tunes, I've not signed them yet but they have been working well in the clubs. Also just finished up a couple of remixes which should be coming out fairly soon." "When I started making music I was obsessively reading the Grid on Dogsonacid.com (a Drum 'n' Bass production forum) and there seemed to be a general consensus on how to make tunes, with what instruments should be filling certain frequencies and how much you should compress certain things, etc, etc. What I have learnt from making music is that everything is about personal taste and what you think works. Use your ears and learn to trust them rather than following a bunch of rules written on the internet by strangers." "I used to be absolutely terrified of using distortion, I have no idea why. Now I feel that it's a very important part of production; adding harmonics to a dry sounding bassline, giving a bit of grit to your drums or changing a sound completely. I now like my music to sound a little bit gritty, overly clean tracks tend to bore me after a while." "I used to go through long periods when I was unable to make music, now I have realised that if things aren't going well I just have to stop and do something else; go for a bike ride, read a book or have a mix. Whenever I sat in my studio and forced myself to work on music I made terrible music and ended up frustrating myself and pushing myself deeper into ruts."